Atragon are a five-piece Edinburgh-based band. Their debut, Volume 1, is available on Witch Hunter records and consists of two tracks released ostensibly as demo recordings but apparently polished and remixed for this release. The album continues the tradition of heavy doom releases featuring the ‘Volume X’ moniker, starting with Black Sabbath’s IV and continuing with Sleep’s I and II releases. The lineup of the band has already changed since the release of this album, with guitarist Danny Sweeney leaving the fold. Track one, The Sound in the Halls, clocks in at ten minutes long and opens with a confident, and surprisingly memorable, riff. The guitar tone here is perfect for the genre being fuzzy but suitably heavy. The two guitarists are panned left and right, creating an impressive wall of sound. The drum hits are also very present in the mix. The influence of Electric Wizard is probably the most notable here with the tempo of the music appearing almost to slow down whist the riffs sound like they are constantly falling towards the ground. The vocals are also suitably tortured, being compressed and distorted to the point of incomprehension, and work well with this style of music. Track two, Jesus Wept, starts off with a similarly downward spiralling riff. However this breaks away into the same sort of proto-Maiden gallop present on Black Sabbath’s Master of Reality or (surprise!) Volume IV albums; heavy in cymbal work in a similar manner. Once the band exhausts this tempo the music abruptly hits a much, much slower tempo as a different riff is introduced. Thematically this is identical to Electric Wizard’s Weird Tales off of Dopethrone, where a faster section of music preludes a catatonic section that nears drone-metal levels of single-digit beats-per-minute tempo. However either the mix or the confidence of the band seem a little suspect here as the band struggles to keep the music working at this tempo. Slow-filtered ambient sounds work well with the backdrop of sustained guitar chords, but something is missing here. After the band trawl this slow-tempo section they return to the original Sabbath-esque riff again bringing the track to an end a full fourteen minutes from the beginning. What makes this release interesting is the fact it is a demo, and therefore representative of the band as a whole at the very beginning of their musical career. The influences are clearly audible, with Electric Wizard taking the lion’s share here (imitation is the sincerest form of flattery!) though an earlier doom influence from Candlemass and Saint Vitus is also present in the sparse arrangement of some of the riffs. However bands such as Electric Wizard arrived at their sound and image through years of jamming, getting thrown out of clubs and rehearsal studios, and aggregating all the cheap but (then) terminally uncool tube amplifiers they could purchase. To lift this mentality and aspire towards this sound and aesthetic wholesale is quite a big step to take. 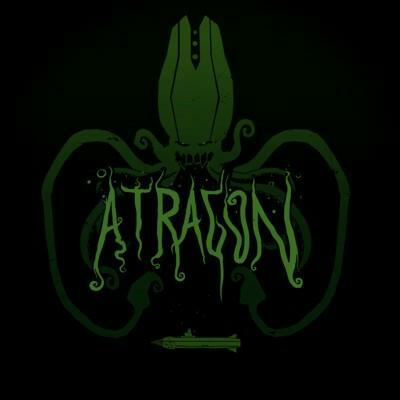 Atragon do present their take on the doom genre very well, and to release such a strong debut album really stands in their favour. However there is almost an air of pastiche, or some sort of studied mythology, concerning their image and online presence which seems to revel in the same drudgery that Electric Wizard adopted through necessity. This makes it hard to understand the direction of the band; is this a parody in the nature of Spinal Tap or is this an earnest attempt at making some notably different music? It will be interesting to see what, if any, influences creep into Atragon’s music as time passes to get a better understanding of what is at play here. On a slightly less existential level, the named are lucky that the producer here shared their vision and created such a dense and organic production. My only gripe is that the bass guitar seems to have been terminally low-pass-filtered so that it is present but not lending the same character to the recordings as the guitars. A healthy chunk of any classic doom-genre sound comes from having a rich bass guitar sound that compliments and works with the guitars whereas here it is mixed a little conservatively overall. However this is a demo recording, and given the weak bass mix on releases such as The Melvins’ debut Gluey Porch Treatments, it is still an impressively powerful release and hopefully indicative of good things to come.